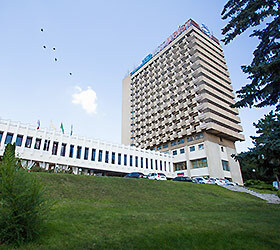 "Intourist Hotel" is conveniently located at the foot of picturesque Mashuk mountain, in administrative, business and shopping centre of Pyatigorsk city. It stands overlooking the magnificent Caucasus Mountains and the majestic Elbrus. On top of comfortable accommodation, the hotel provides guarded parking, secure stay and flawless service. A total of 152 rooms is available at the hotel, the categories ranging from Standard to Apartments. Decorated in warm color palette and appointed with modern furniture, these rooms provide everything required for enjoyable rest and productive work. The Standard room includes - double bed or twin beds, IDD telephone, satellite TV, fridge, balcony, bathroom with the necessary toiletries (shampoo, soap, shower gel). Rooms of superior categories additionally offer - bedroom and living room with upholstered furniture, bathrobe, slippers, toothbrush and toothpaste, shaving kit, comb, shower cap, shoe-shine. Guests can avail of the many leisure possibilities at Intourist Hotel. The Rendezvous Cafe & Club offers breakfast, lunch and dinner. The cafe hall can suit for any occasion, a banquette, private party, or drink reception. The hotel's billiards hall is a place where one can meet new friends and spend the evening. As an alternative, one can opt for the lobby bar, serving aroma coffee, drinks and snacks, or for the bars that are located on the 3rd and the 7th floors. In addition, the hotel building accommodates air tickets office, massage room and dental office.